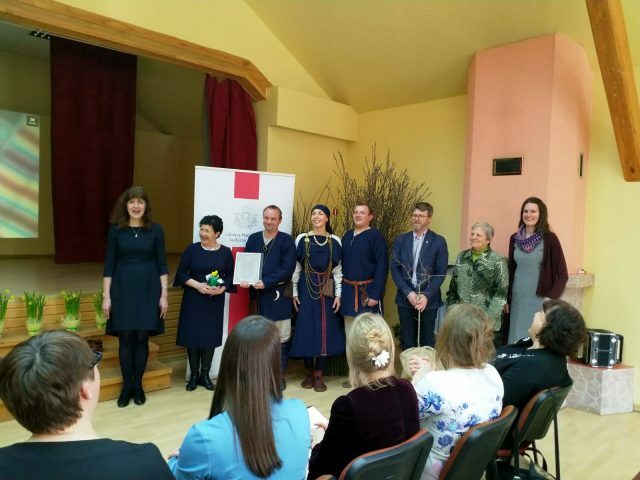 An official ceremony on March 29th at the Krape Community House recognised the individuals who had nominated the seven different aspects of cultural heritage recently added to the Latvian National List of Intangible Cultural Heritage. The recipients included the Livonian Culture Centre (Līvõ Kultūr sidām), which, along with the Livonian Union (Līvõd Īt) and the Ventspils Livonian association “Rānda”, nominated the Livonian cultural space for inclusion in this list. Livonian community members receiving official recognition.